Paine Field, also known as Snohomish County Airport, is located north of Seattle. The airport was started as a Works Progress Administration (WPA) project in 1936, and was slated to become one of ten ‘super airports’ in the nation. The U.S. Army took over the field prior to WWII, to use as a patrol and training base. After the war, facilities were assigned first to the U.S. Air Force, then to the U.S. Army Air Defense Command. There had been plans to use the site for deployment of the SENTINEL Anti Ballistic Missile System, but that never materialized. Instead, in 1966, Boeing needed a location to construct their new 747 jumbo jets, so a deal was struck to develop construction facilities at Paine. In the late 1970’s, new local agreements defined the airport’s future. These were known as the Mediated Role Determination (MRD), and they declared that the airport would focus on aircraft construction and general aviation, while avoiding the development of any commercial service. FAA does not recognize the MRD, so when Horizon and Allegiant expressed an interest in Paine in 2008, FAA entered into the fray and warned the airport authority that a failure to negotiate would put the airport in jeopardy of losing future airport grants. In late 2012, FAA announced a Finding of No Significant Impact (FONSI), indicating their belief that the addition of air passenger service would be acceptable. There are no terminal facilities at the airport, so nothing further will happen unless and until the funds are invested to accommodate commercial passenger service. The airport has 543 based aircraft (470 single-engine, 53-multi-engine, twelve jets and seven helicopters) and sits on 1,315 acres. The ATC tower is staffed by FAA controllers and is open 14-hours per day. The controllers average 311 operations per day (thus, 11 takeoffs per ATC-hour), with 46% being local pattern traffic. Paine Field has a pair of parallel north-south runways, one of which is only 3,000′ long and thus usable only for the many small GA aircraft based on the airport. 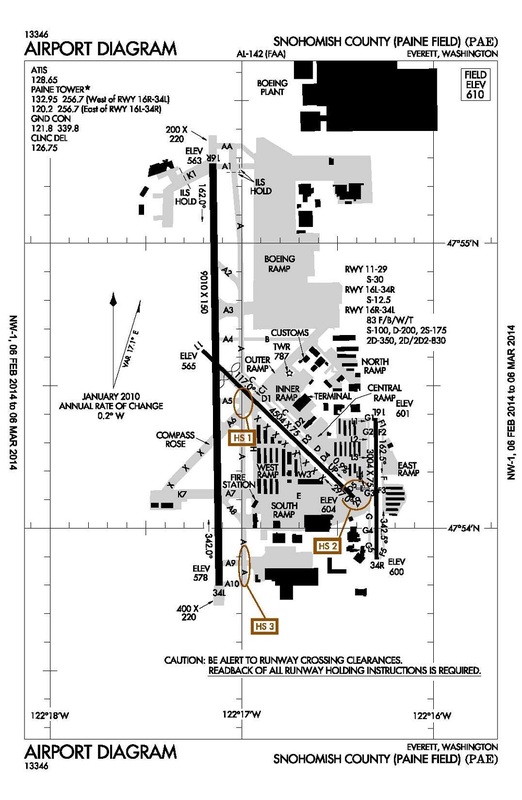 A diagonal runway is no longer used for takeoffs. The airport has numerous flights schools. FAA compiles ATADS data for this facility. Airport operations in 2012 were DOWN 22% vs. 2007 operations, and DOWN 50% from the peak year (2000). — Average AIP Subsidy is $34 per operation. …EXXCERPT: “The Pacific Northwest Aerospace Alliance today endorsed commercial air service at Paine Field in Everett (WA). The move is highly controversial. The Snohomish County Council and the City Councils of Edmonds and Mukilteo, adjacent suburbs, oppose the service….” PNAA is a trade group. …Allegiant approached the airport authority about the possibility of starting two weekly flights out of Paine Field to Las Vegas. The airport has no terminal facilities and many feel that commercial flights would be a poor fit in the area, so officials rejected the idea. FAA then warned that negotiations must happen, since PAE had received airport funding from FAA.